The February 26, 2015 U.S. EIA Natural Gas report continues to illustrate the sharp rise in Utica Shale natural gas production. The data and diagrams also put some perspective on how the Utica compares with the rest, both in growth and total. 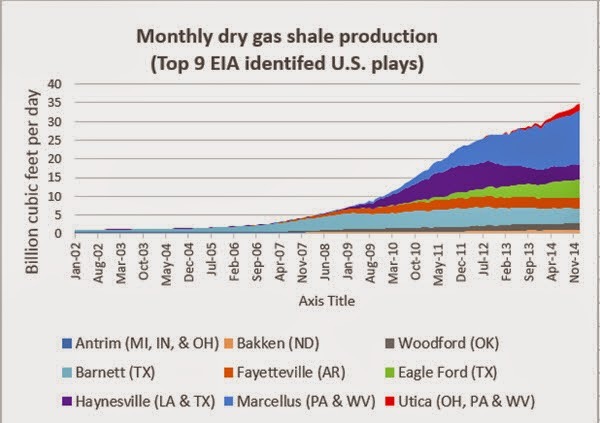 The graph immediately below shows the top 9 shale gas plays by natural gas production. 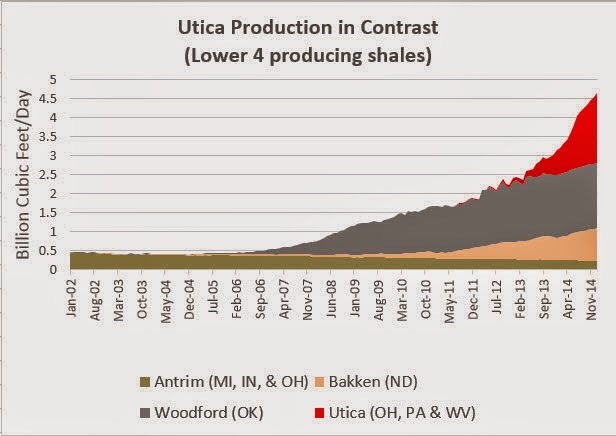 Note the relative obscurity of the Utica Shale, red sliver at the top of the graph, yet seemingly coming out of no where and growing rapidly. The large blue area underneath is of course the Marcellus Shale, the champion of them all. Note also that while the Bakken is a significant oil producer, it does not produce much gas. In contrast, the Eagle Ford, noted for oil production, also produces a significant amount natural gas. Like Utica Shale, the Eagle Ford shale has a fairway that is noted for producing gas and a similar, parallel fairway, producing primarily liquids. Looking at just the bottom 4 of 9 producers (which includes the Utica Shale, again in red), shows how the Utica has comparatively risen to significance necessitating that the EIA include the Utica Shale in its weekly production reports.